In ‘A Night in the Sea’ WTP Wolston discusses ‘The Salvation of the Lord’ beginning with the night-time crossing of the Red Sea in Exodus 14. This is the first time Salvation is mentioned in Scripture, and the author explains in his own very clear and down-to earth way how wonderfully it is all coupled with a person - the person of the Saviour. ‘He who possesses Christ has God's salvation’. As the author says: “Salvation is a very large word. It comprehends forgiveness, and deliverance, and peace, and the knowledge that I am justified…Every believer in Christ is entitled to know what is presented here in type, and figure, and he can then sing sweetly, simply, and happily, "He is become my Salvation." 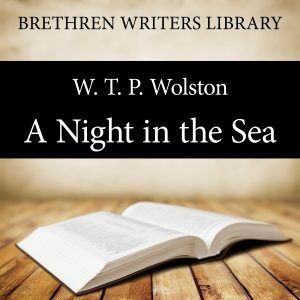 The song of the redeemed, the protection of the Lord (‘He Himself stands between His people, and the pursuing enemy.’) and many other wonderful Gospel truths are illustrated clearly by this gifted expositor here in ‘A Night in the Sea’ ,which is part of the author’s excellent book ‘Night scenes of Scripture’. A word about the author: WALTER THOMAS PRIDEAUX WOLSTON (1840-1917) was born in, Devon, England. He says himself that before he was converted he was a most thorough going young worldling, deeply immersed in its pleasures and its sin, but in London in 1860, the Lord met and saved him. He began as a lawyer and later he established himself as a physician in Edinburgh. He dearly loved the Gospel, and it mattered not what subject he discoursed upon to Christians, he never finished without preaching God's salvation. He had a wonderful influence over young men, and frequently lectured to students in Edinburgh on spiritual subjects. He was the Editor of the magazine entitled ´God´s Glad Tidings’, afterwards altered to ´The Gospel Messenger´ for forty-five years, and many clearly written Gospel booklets have come from his pen. He also wrote books on spiritual subjects, which have been helpful to many, including: "Young Men of Scripture", "Night Scenes of Scripture", "Behold the Bridegroom", ""Seekers for Light" and "The Church". So that by means of the printed page Dr. Wolston has been, through the grace of God, a means of blessing to thousands of both saints and sinners.